Managing and keeping track of all your business card contacts is little annoying. Even if we live in a digital world people still use business card and it has become a practice in exchanging business cards. Pen Power Technology has come up with a business card reader iPhone app to scan and store contacts on your iPhone’s address book. 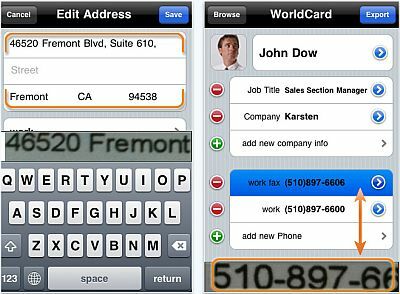 There are many business card reader app for iPhone, but I found World Card Mobile App for iPhone pretty unique comparing with other available apps. So whats so special about WorldCard iPhone App Mobile? •	Recognized image is automatically classify the details on the business card and puts the data in appropriate categories. •	Option to merge data into existing contacts. The interface of the app looks simple and elegantly designed with the main menu displaying necessary functions like take a snap, select a picture and setting to change the language option. Using this app, I didn’t find any difficulties in scanning the business card and the output was excellent. Sometimes the app may not properly assign the text to the appropriate category on your contact box, at those times you can tap back to the card and make a box around the relevant information. Since I used many business card reader app for iPhone, I found WorldCard Mobile has a great sensor to gain proper inputs. Ultimately, I found this iPhone app very useful to add business card details to your iPhone without any frustration. Surprisingly I am well impressed with its performance and will be recommending it for my friends. Get this WorldCard iPhone App here!